Rehearsals take place in the main building of the Jeugddorp Leiden Zuid-West (Youth Village Leiden South-West). 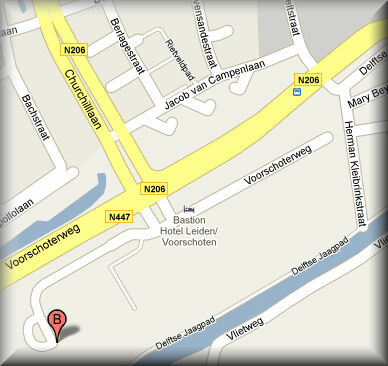 At the T-junction with Churchilllaan near the Bastion hotel and swimming pool 'Zwembad de Vliet' (see map below). The orchestra rehearses on Wednesday evening from 20.00 to approximately 22.15. The building is also used by the motor club Black Caps. Follow the road through the steel gates. The road bends left and you'll find the building 50 yards ahead on the left. On Facebook you can find Leids Harmonie Orkest too. Follow the orchestra by liking the page! The Leids Harmonie Orkest tweets at lhk49. The association is registered at the Chamber of Commerce The Hague with the number 40448522.